Before I proclaimed my faith to the Holy Brunch Trinity of bacon, Bloody Mary, and Benedict, I spent my Sunday mornings roasting in a church clogged with Frankincense smog and choral hymns—a rite of passage for nearly every Catholic kid. Each mass was spent stumbling through call-and-response prayers and counting down the minutes ’til I’d be back home basking in the glory of a Xena: Warrior Princess rerun. 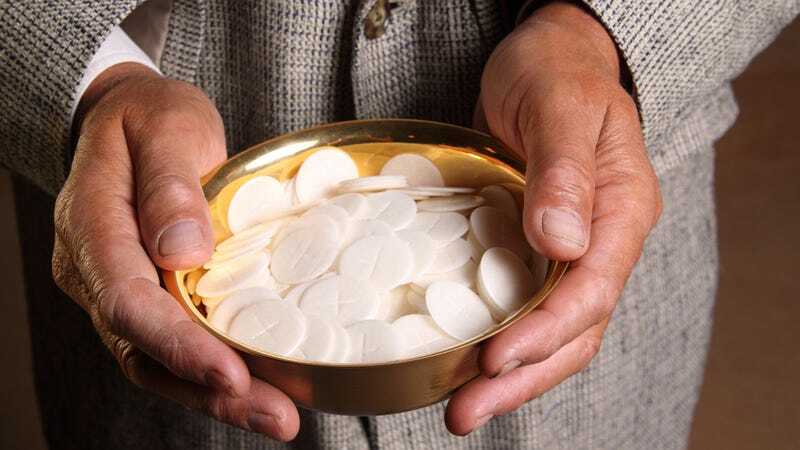 The only respite came with Communion, signaling the near-end of mass and giving me a chance to nosh on the impossibly dry, oddly addictive wafers that we called the Body Of Christ. Week after week, I would relish the moment when I could pop one of the papery saucers in my mouth, sometimes chomping right into it, other times stowing it beneath my tongue to savor the vaguely bread-like taste. My brother and I would spend post-church car rides home expounding on its mysterious origins. Are there actually pieces of Jesus in these? Don’t these kinda taste like Satellite Wafers? This was a holy mystery that I was bent on unraveling. Once I was forced into CCD (Confraternity Of Christian Doctrine) night classes, I had an epiphany. No, it wasn’t the “come to Jesus moment” that all parents hope for when carting their kids to weekly Catholicism crash courses—I realized that I needn’t wait for Sunday mornings to cop my Sabbath snack. All I needed to do was slink out of my classroom and into the secret chamber behind the church altar, where the wafers were stored in bins by the thousand, ripe for the picking. Forget the apple of Eden—this was temptation incarnate. Just like Lady Bird and her compatriot, my classmates and I would devour the wafers like Ruffles as we swapped gossip, traded war stories of congregation nun Sister Marilyn’s reign, and wished aloud to be freed from church, from small-town Indiana in general. Those hallowed snacks are forever linked to sweet and simple times, but the wafers themselves have a melodrama of their own. From recipe tinkering to sacrilegious coopting, communion wafers’ tumultuous history goes far beyond church walls. Communion wafers (or “hosts”) are the cornerstone of the Eucharist. A tribute to Jesus’s Last Supper with his disciples, the Eucharist is a ritual during which a priest (figuratively) converts silver dollar-sized disks of unleavened bread and a chalice of red wine into the body and blood of Christ through a process called transubstantiation. During the ritual, Christians are reminded of the sacrifice that Christ made on the cross, faith is professed, and parishioners queue in the aisles to receive Holy Communion: one of the wafers and a sip of the wine. That’s where the simplicity ends, though. Before the production of communion wafers was industrialized, preparation was left to a congregation’s contingent of nuns. Equal parts white flour and pure water were mixed until a crepe-like batter formed; then yeast and salt were added. The mixture was then ladled onto a glorified waffle maker, rigged with flat griddle plates occasionally adorned with biblical symbols. The sheets were stacked into towers and underwent a daylong drying process before before being cut into individual disks with a stamping machine. Over the course of the past decade, Cavanagh Altar Bread has muscled into the preparation equation. A family-owned company cornering one of the world’s most recession-proof markets, the Rhode Island-based outfit now supplies about 80 percent of the United States’ Catholic, Episcopal, Lutheran and Southern Baptist communion breads. With over 60 years of business behind it, Cavanagh’s automated production process has left the wafers “untouched by human hands” and stripped countless nun of a core duty. Beyond manufacturing, Cavanagh Altar Bread continues to change the wafer-slinging game, most notably by daring to tinker with the sacred bread’s recipe. Swapping whole wheat flour for the traditional white, Cavanagh has created a “low-gluten altar bread” for Celiac-stricken Christians. These alternative wafers are tawny in color, bread-like in mouthfeel, and, unlike their traditional counterparts, don’t taste like wet chalk. The Vatican wasn’t nearly as enchanted with these concessions. In 2017, Pope Francis enlisted Cardinal Robert Sarah to pen an open letter condemning gluten-free wafers and any deviations from the original recipe. Low-gluten wafers are tolerated, given that they meet a gluten composition benchmark. Severe Celiac sufferers’ only Eucharistic recourse, then, remains a swig of red wine from the shared chalice. No longer reserved for hungry Catholic schoolkids and zealots, communion wafers have edged their way into the mainstream diet over the years. In Quebec, shoppers can snag a bag of wafers while picking up a frozen pizza and a scratch-off from their local grocery store. Billed as a low-calorie snack, the “host cuttings” are nestled in gleaming plastic bags between potato chips and popcorn at the local IGA. While the commodification isn’t considered sacrilegious (the hosts are not blessed by a priest), the concept has left some queasy. When I stumbled upon the communion wafer bunker nearly two decades ago, my first impulse was to share the triumphant Nancy Drew moment with my dad, who spent his childhood in the very same church. I expected revelry, maybe even congratulations; instead he wondered aloud, “I wondered how long it’d take you to find that.” Just like those characters in Lady Bird, turns out I was far from the first to want to demystify the mystery behind the Holy Communion wafer.